German handball players wowed spectators in Berlin, Cologne, Hamburg and Herning/Denmark with their enthusiasm, fighting spirit and thrilling games for two weeks. Despite their unlucky last-minute defeat in the final of the World Championships, Philip Harting paid tribute to the German team for their performance. “It was a fantastic advertisement for the sport of handball, even if it didn’t end with a winner’s medal,” said the Chairman of the HARTING Technology Group. The players wore shorts with the distinctive HARTING logo for the World Championship matches in Germany and Denmark, and the logo also featured on the floors and advertising boards. With their friendly manner, sportsmanship, convincing wins in the group stages and big personalities, the national team won the hearts of the fans and did plenty to make handball even more popular in Germany. “The team has won back its place among the best teams in the world. Germany is back at the top,” said Philip Harting with conviction. 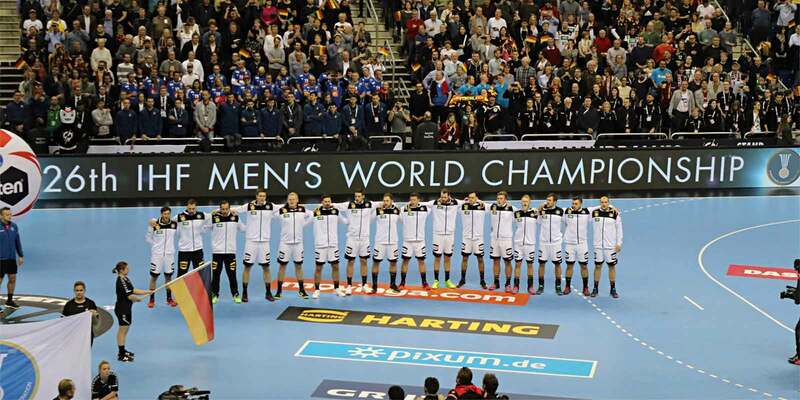 The HARTING Technology Group has been a premium partner of the German Handball Federation (DHB), a supporter of the national team and the junior team since 2017. The players wore shorts with the distinctive HARTING logo for the World Championship matches in Germany and Denmark, and the logo also featured on the floors and advertising boards. “Matches were broadcast across a number of countries, raising the profile of the HARTING brand worldwide as an innovative technology company that is also a committed friend and supporter of handball,” was Philip Harting’s positive take on the World Championships.